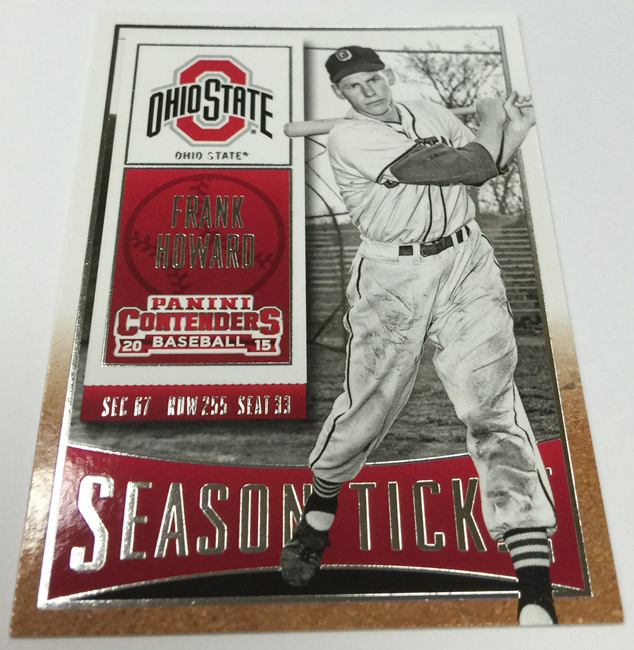 Exclusive retail-only packs of 2015 Topps Chrome Update are now available in stores, and they can be found only in Holiday Mega Boxes. 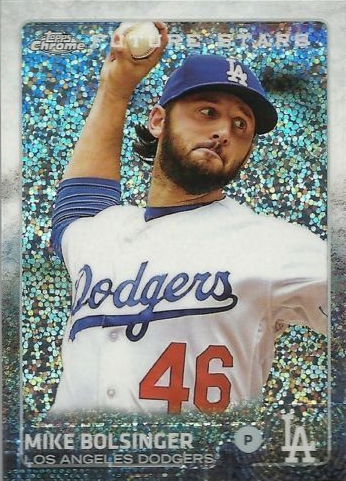 For a retail listing price of $14.99 you get five packs of 2015 Topps Update (their normal flagship Update cards) and two packs of the Chrome Update cards. So, they are a bit scarce. Go here for a complete checklist. 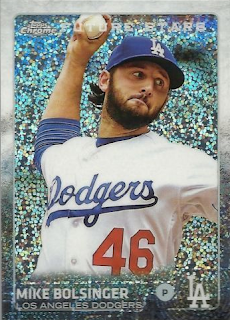 The Chrome Update base cards feature only 50 of the 400 cards found in the normal Topps update set, and they are easily distinguishable due to their "Bubble/Pulsar" Refractor finish. As you can see in the pics below, they are super shiny and have that distinctly round bubble-style background. All of the cards have this look. 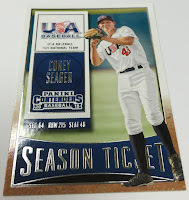 Below are all the Dodger cards that are available. 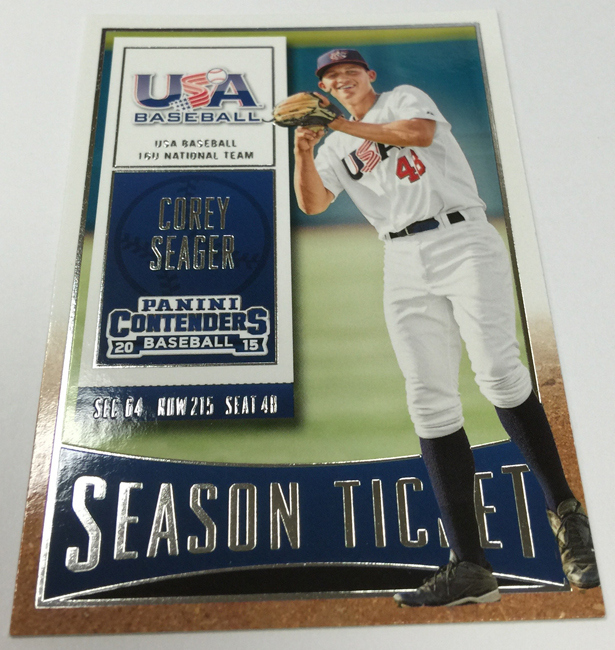 As you can see, only three of the twenty-three Dodger cards found in the update base set are available in Chrome form. The photo above would be the culmination of many young boys lives. 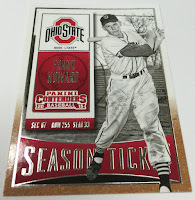 After all, who didn't want to be either a ballplayer or a fireman... But to be both at the same time would cause most young minds to explode. Featured, you've got Dodger manager Chuck Dressen and pitcher Joe Black spending the afternoon as fireman - complete with Brooklyn Ladder 13 helmet and firetruck. 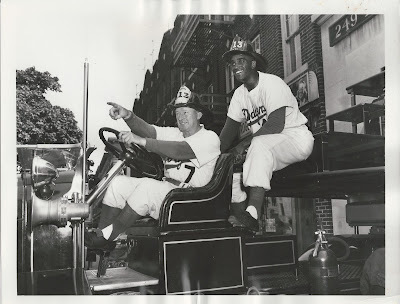 No doubt Black, who was a phenom rookie reliever when this photo was taken in 1952, was in the midst of preparing to put out some wildfires at the Stadium and throughout the city. Ruggiano, who made $2.505 million in 2015, would have been eligible for salary arbitration had he remained on the 40-man roster. He has enough service time that he can reject the assignment and become a free agent. BTW, per Eric Stephen at True Blue LA, Ruggiano chose to enter free agency. I wouldn't be surprised if he ended up staying a Dodger. David Laurila at FanGraphs shares an fascinating interview with former Dodger pitcher Aaron Harang, here. He talks a bit about the art of pitching - throwing up in the strike zone (like Chris Young), adjusting to changing strike zones and breaking pitches. Via David Hood at True Blue LA, "Dodgers top 2016 prospects: Nos. 31-61." Via Xavier Alatorre at the Sports Quotient, "Joc Pederson And Patience At The Plate." What does this mean going forward? Despite flaming out in the second half, the 2015 season cannot be considered a bust for Young Joc. The twenty-three-year-old hit an inevitable slump but made adjustments that paid off in the last two months of the season, though they may have gone unnoticed by some. Now that National League pitchers have seen a full season of Pederson’s swinging tendencies, adjustments will need to be made at the plate. Pederson needs to continue his patient approach and force pitchers to come to him. If he is able to stay away from outside pitches and can wait for more favorable pitches (low and inside) to land in the zone, then Pederson will be a formidable threat at the plate once again. 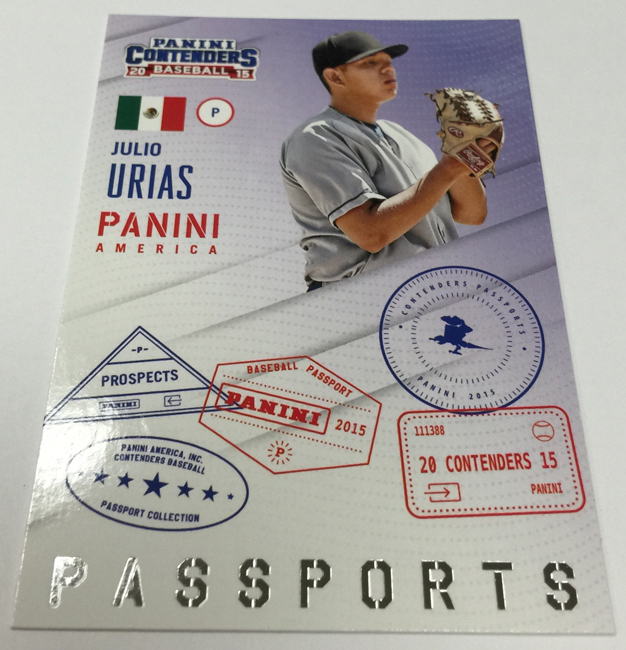 Next week Panini will be releasing their 2015 Contenders Baseball set and it includes a bunch of fast rising prospects and some old pro's. Go here to check out a huge collection of preview photos. 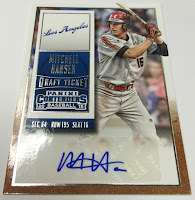 You can also see cards of Dodger prospects Julio Urias, Corey Seager, Mitchell Hansen and former Ohio State star and former Dodger Frank Howard. The Senate report on the "pay for patriotism" brouhaha has just been released and is available here to review. Fortunately, the Dodgers do not appear to have charged the armed forces, but other MLB clubs who did get paid to fake their patriotism includes the Braves, Red Sox, Diamondbacks and Phillies. The DBacks received $40,000 from the Arizona Army National Guard to allow color guard demonstrations, a first pitch and a 40 tickets. Shame on you guys! Jason Lisk at The Big Lead has the story here. The report lists 50 professional sports teams from the NFL, MLB, NBA, NHL and MLS that received some sort of federal funding to do a “pay for patriotism” promotion where it appeared to be honoring a military member or branch, but where they were receiving money for engaging in the activity.